Brad is a native of Lake Wales, Florida and grew up in the citrus industry. Brad attended Davidson College in North Carolina, majoring in History. Prior to attending law school, he clerked on the New York Cotton Exchange. 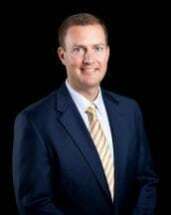 After graduating from the Florida State University College of Law, Brad began his career with Hill, Ward & Henderson in Tampa, Florida. Brad and wife, Ashley (a Fort Walton Beach native and practicing lawyer) moved to Fort Walton Beach in 2003.